Decorating precisely and consistently is a difficult task in any bakery, restaurant, or cafe. Every small decoration takes a steady hand, and a hefty amount of time. For chefs who run a full-scale restaurant and a bakery, or for those who have too many custom orders to personally make standard desserts, transfer sheets are the best tools in the kitchen. Transfer sheets are a modern way to decorate confectioneries. These are an easy and simple way to turn your ordinary cakes, candies, or cookies into culinary masterpieces. The vibrant colors and designs of our transfer sheets will only help you stand out among your competitors. Each of our transfer sheets have beautiful designs printed on them in cocoa butter. This ensures that the taste of the decoration doesn’t interfere with your delicate desserts. We have multiple designs in transfer sheets including pink and purple flowers, yellow swirls and stars, dark squiggles, and red hearts. The various designs allows chefs to choose which design to put on their confectioneries, depending on their theme or the time of year. 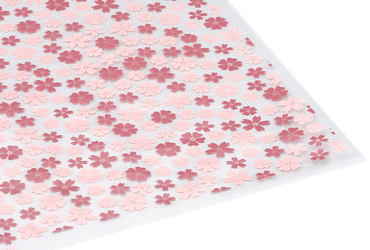 Our transfer sheets can be used to put designs on cakes, cookies, or candies. Chefs can also be creative and use these for various other dishes. Each design is modern and chic, so guests and customers will easily be impressed. You could also mix and match different designs to create a whole new aesthetically-pleasing experience. If you want to decorate the sides of a specific-sized cake, measure the transfer sheet to be the correct height and width. Use a razor knife to cut the sheet. Melt your chocolate either over a pan or in the microwave. Make sure it doesn’t burn! Once the chocolate is melted, lay the Restaurantware transfer sheet flat on a sturdy surface. Make sure the rough side, with the cocoa butter design, is facing up. Spoon the melted chocolate onto the transfer sheet and spread evenly across the sheet with the metal spatula. Don’t spoon too much at one time -- the chocolate should be thinly layered on the transfer sheet. Also, don’t worry about staying in between the transfer sheet lines; it’s fine if the chocolate goes over the sides. Once you spread the chocolate, let it set for 5-10 minutes. You know it is ready once the sides set a bit, but the chocolate isn’t completely hard. Remove the extra chocolate on the sides. Now, if you wish, you can use the chef’s knife to cut your desired shapes in the chocolate. If you don’t get clean cuts, let the chocolate set a bit more. If you’re decorating the sides of the cake, apply the transfer sheet to the sides and tape together. Let your chocolate cool to room temperature. If you don’t have the time or patience, then stick it in the refrigerator. After the chocolate is fully set, carefully remove the transfer sheet, and voila! You have beautiful and colorful decorations. These quick and easy steps can save chefs tons of time in the kitchen. Using transfer sheets can give your customers and guests the illusion of hours spent decorating that particular cake, cookie, or candy. There are different ways to create beautiful decorations with our transfer sheets. Instead of just putting a transfer sheet completely on the sides, try decorating smaller pieces of chocolate (like triangles) and lining them around the sides. These geometric shapes will add a modernistic feel to any ordinary cake. Mix-matching different transfer sheets can also add a unique flair. 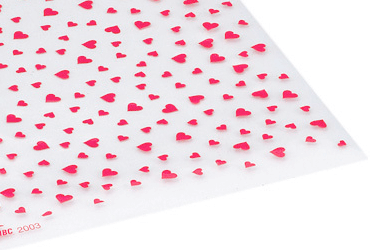 Our dark squiggles and red hearts transfer sheets could be mix and matched on a tier cake to make a fashionable cake for Valentine’s Day. Your guests will be impressed with the neat, stylish look that you got from our premium transfer sheets. 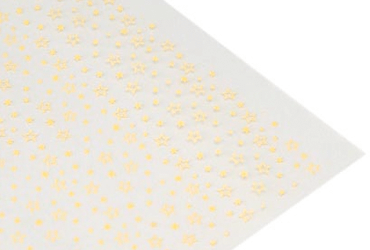 Each of our transfer sheets are 11.8 inches long, so you can either decorate a large cake or multiple smaller pieces. They will come to your door in a 30-count box, so you will have a large stock for your business. Our transfer sheets are the answer to many chefs’ problems. These are a way to give customers personal decorations, but saving a majority of the time. So, don’t hesitate! Browse our transfer sheet collection and try them out today.